NET Ministries challenges young Catholics to love Christ and embrace the life of the Church. Every August, 175 young Catholics aged 18-28 leave behind their jobs, school, family, and friends to devote nine months to serving with the National Evangelization Teams (NET). Divided into 16 teams, they travel across the U.S. for nine months to share the Gospel with young people and their families. Since 1981, NET teams have led over 32,000 retreats and ministered to more than 2 million young Catholics. NET was started in 1981 in the Archdiocese of St. Paul and Minneapolis. The actual impetus for NET came from its founder and current Executive Director, Mark Berchem. Mark pioneered a team of 12 young adults to travel in a van around southern Minnesota, conducting high school retreats. Moving from town to town, parish to parish, this experimental team conducted 18 retreats in a three-week period during January 1980. The response to this team was extremely positive. Additional requests for this type of ministry came from Fargo, North Dakota, and Sioux Falls, South Dakota. The following January, three teams were sent to serve in Winona MN, Fargo ND, and Sioux Falls, SD. 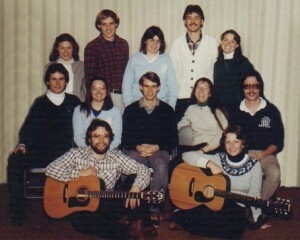 In September 1981, the first year-long team was sent out, adding Wisconsin, Louisiana, and several other dioceses in Minnesota to the itinerary. In 1982, the name “NET,” or National Evangelization Teams, was officially adopted. It was inspired by the scriptures: “Come after me, I will make you fishers of men,” Mark 1:17, and “Put out into deep water and lower your nets for a catch,” Luke 5:4. In 1984, the first team member from another country (Canada) served with NET. Since then, young adults from nearly every continent have served with NET Ministries. In 1985, the first NET team to serve internationally crossed the border into Canada. In 1988, NET began working in Australia, leading to the establishment of NET Ministries of Australia in 1989. In 1994, NET Ministries of Canada was established and the first full time Canadian team was dispatched. In addition, NET has served in Guam, Honduras, Mexico, Germany, Malaysia, New Zealand, Nicaragua, Uganda and Ireland. NET Ministries was incorporated as a Minnesota nonprofit corporation under the ecclesiastical vigilance of the Archbishop of St. Paul and Minneapolis. NET Ministries is governed by a board of directors. NET moved to its present location in West St. Paul in 1992. Thanks in large part to the generosity of NET’s founding benefactor, Rose Totino, NET Ministries was able to purchase the existing facility which serves as the base for both NET’s national headquarters and local outreach.